An elegant invitation from the newest collection. The bottom of the cover is decorated with a beige floral motif. Names of the bride and groom are printed in the upper right corner. On the left side with place the photo, which you will send us. The last page is also decorated with the photograph and the names of the bride and groom. 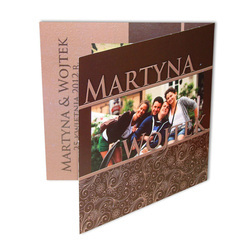 The whole invitation is in a brown-beige colour scheme.